Yes Yes I know….no we have not thrown in the towel and walked away..its just that the last 3 weeks have REALLY moved us down the field and closer to getting out of here! 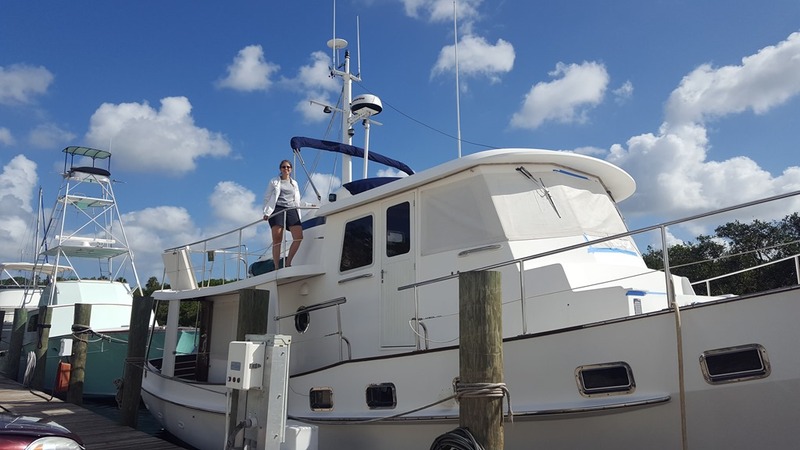 First on deck, or more accurately on the FlyBridge is the Bimini cover that Annette made. When the is not up we need to keep it get shredded in a strong wind. The cover came out terrific! 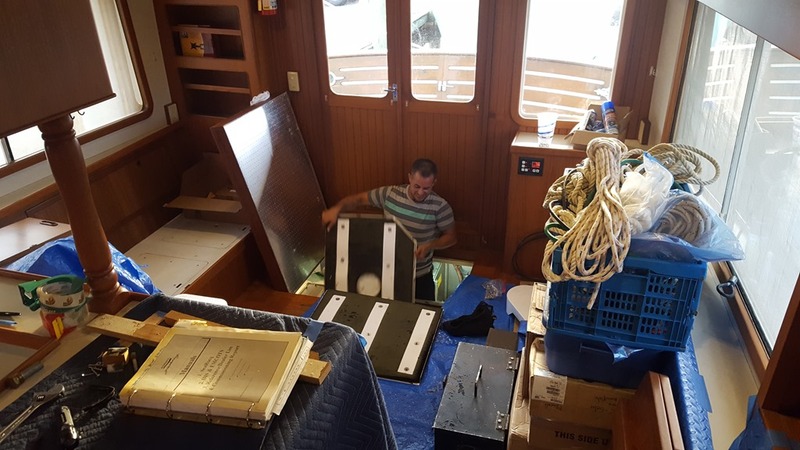 Part of our refit plan included new electronics. 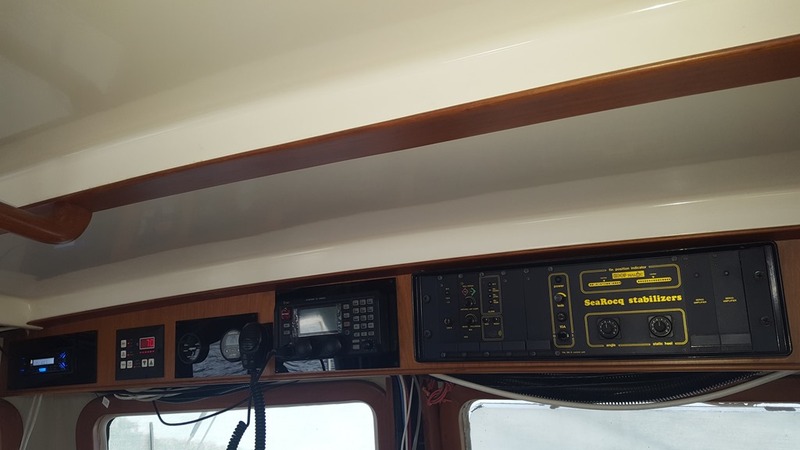 I installed an updated chart-plotter, new instruments, wind, radar, AIS Transponder and two depth transducers. 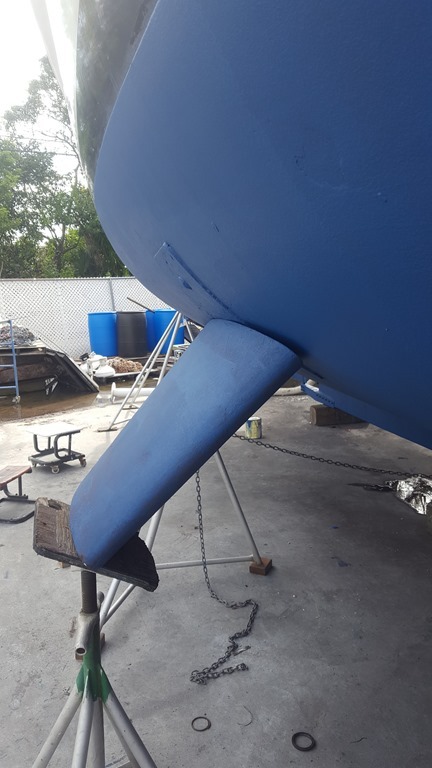 One on each side of the keel so we know which way the deep water is. The unfortunate part is the old equipment was physically larger than the new so I needed to make these large black Lexan plates to mount equipment in. 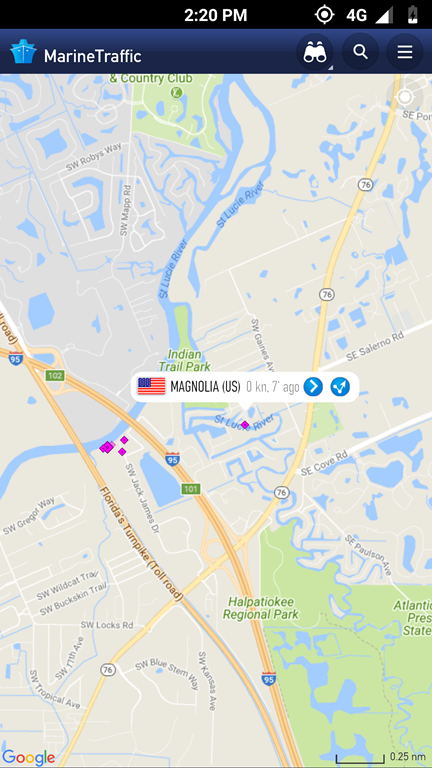 I was able to verify the AIS was functional by seeing Magnolia on Marine Traffic meaning our transponder was functioning. Between the King Tides and the fact that Lake Okeechobee is dumping as much water as possible because of the high water. 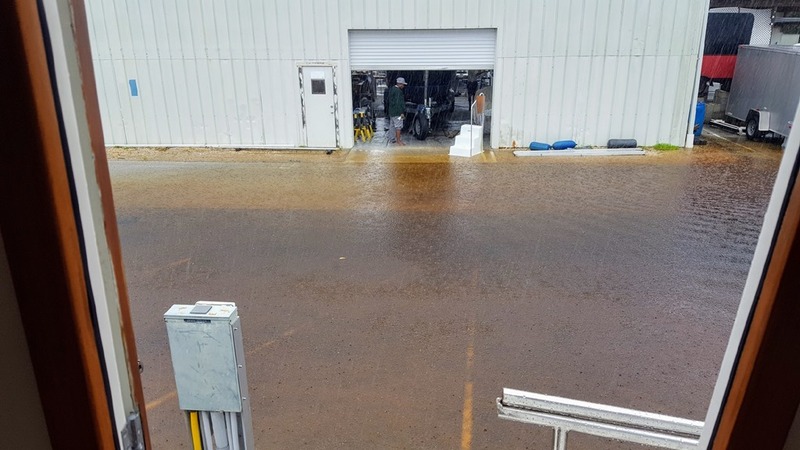 This caused water to completely overtake the docks and flood the parking lot. 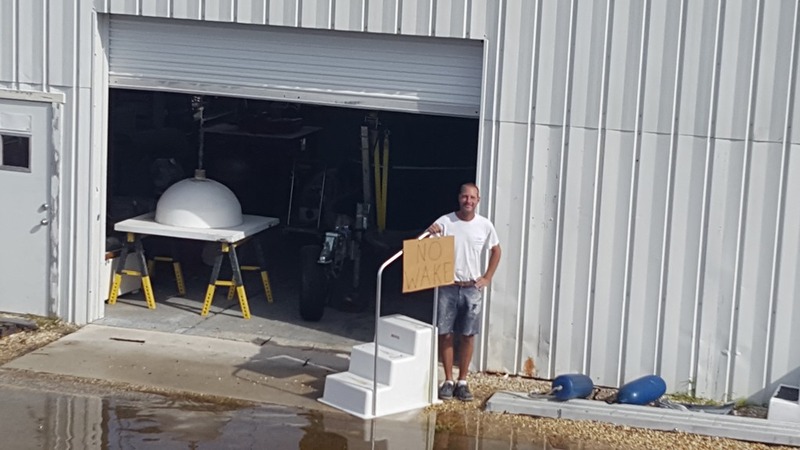 Ray was forced to deploy his “No Wake” sign to limit a car wake from being enveloping his shop! 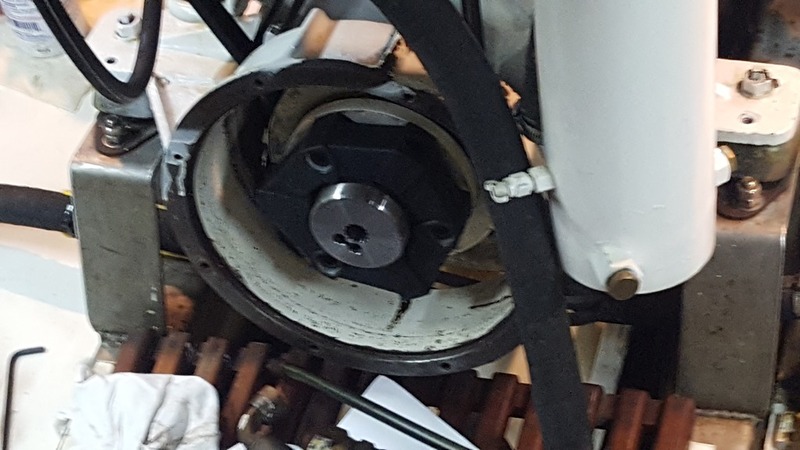 As you see we have finally received out Power Take-Off coupler that connects the engine to the hydraulic pump. We were so happy to see out mechanic Jon get it installed and the pump functioning again. 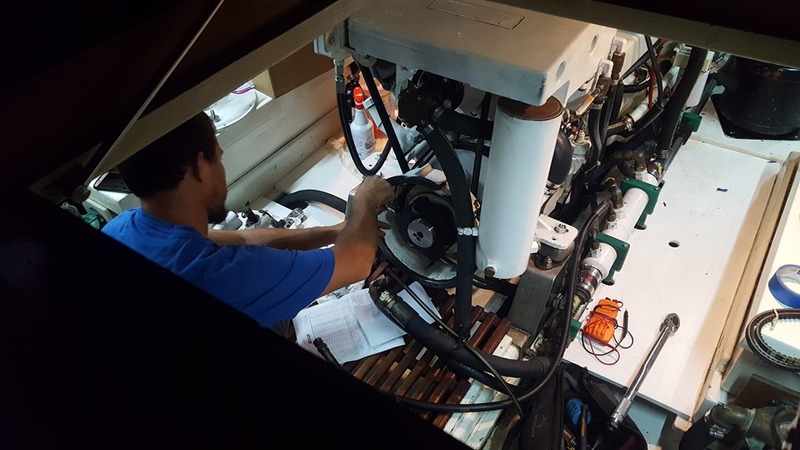 As soon as we got the hydraulics functioning Jon got the rest of the engine room closed up. 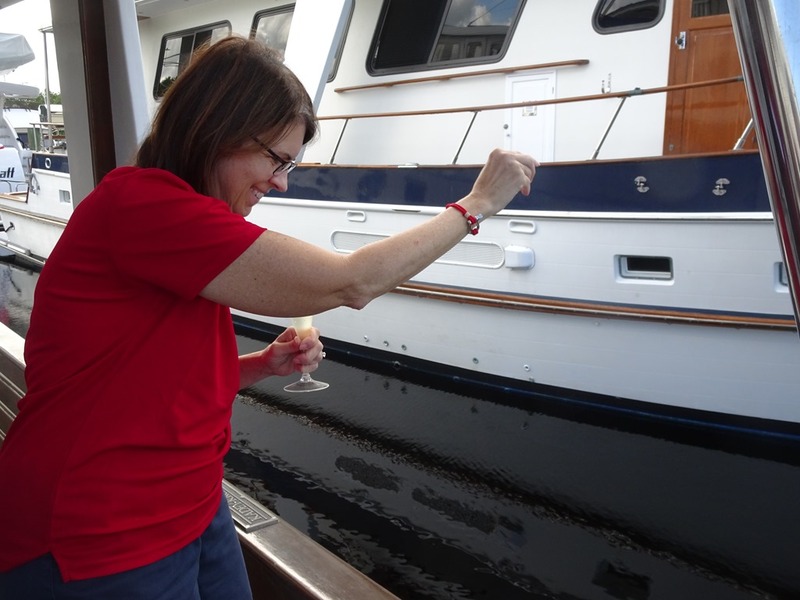 Shortly after that the Admiral (Annette) FINALLY got us off the dock! She did let me drive a little…in the straight wide part of the river that is! Thankfully all the systems check out with the exception of a small leak around the exhaust manifold…need a gasket replaced…..argh. It did set us ready for haulout..more on that in a moment. 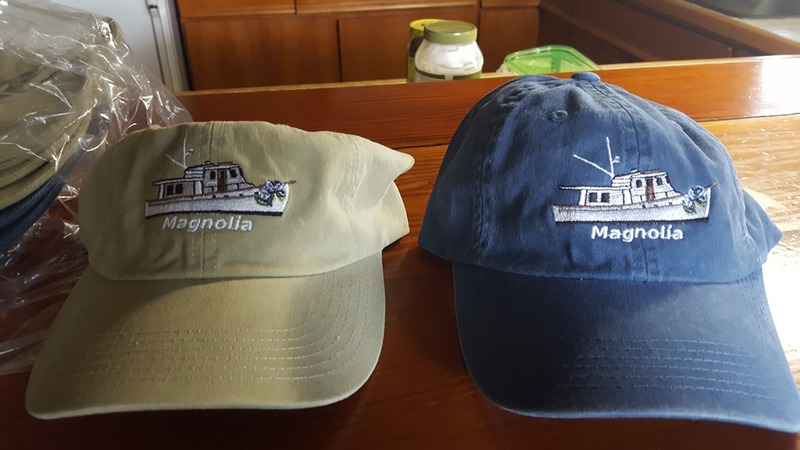 We also received our Magnolia SWAG, available in the Ships Store on the 4th deck…. 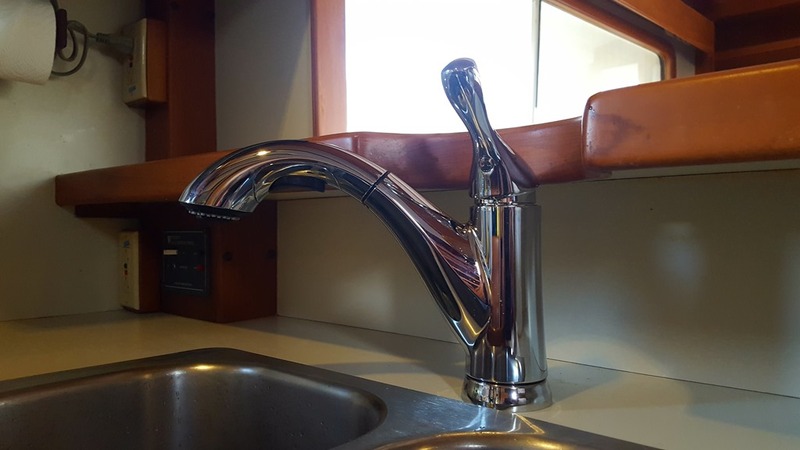 Taking to my domestic side…I did get a faucet installed in the galley!!! 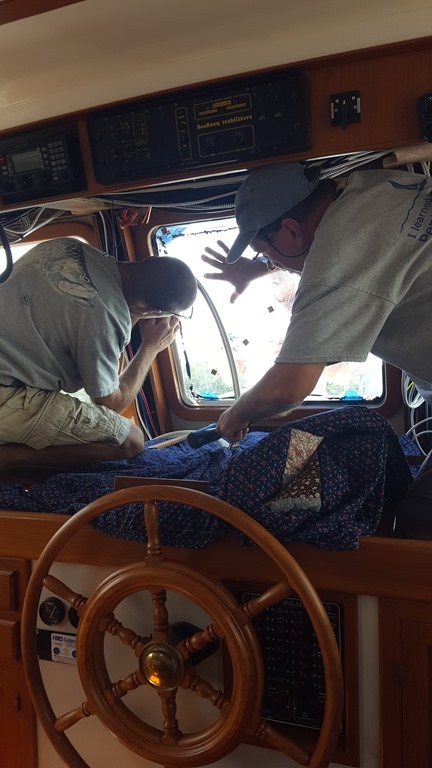 We also replaced the center pilothouse window. 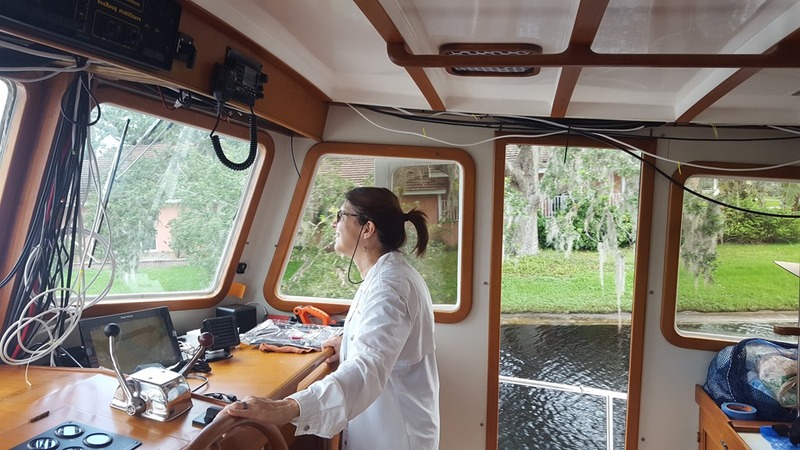 The windows in the pilothouse are 3/8 in safety glass. Boat wise that is some heavy stuff! When Al & Michele arrived we actually had a little time to hang out. This is traditionally accomplished via an engraved ingot delivered to the sea floor. In our case a piece of aluminum with the name had to suffice. 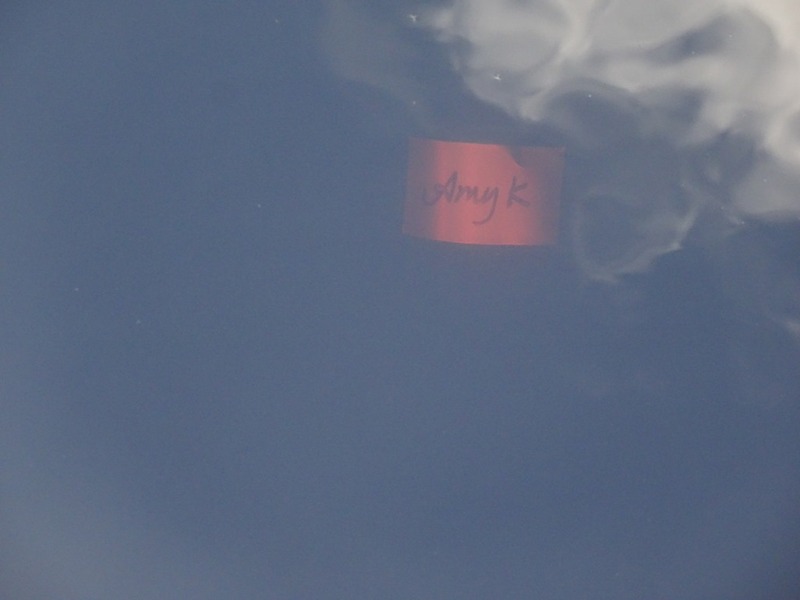 ON EVERY boat there’s a little black box. You can’t see it, but it’s there all the same. It’s full of points that help you get out of trouble. At least, it should be full of points. 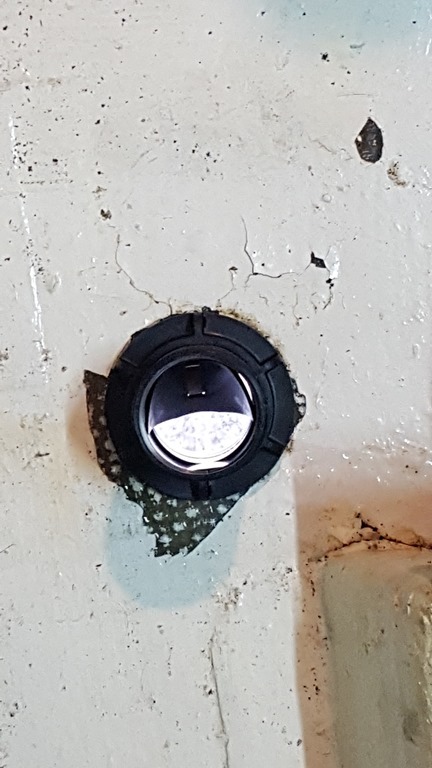 Every time you do something seamanlike, a point goes into the black box. Every time you whip a rope-end instead of leaving it to flap itself to fluff in the breeze, you earn a point. 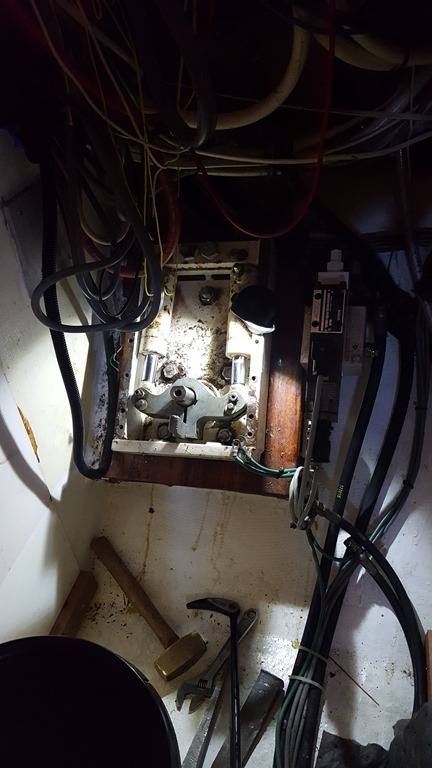 Every time you study the chart before entering a strange port; every time you climb the mast to check the topmast fittings; every time you remember to use the bilge blower before you start the motor, the points pile up in the black box. At sea, the system starts to work two ways. 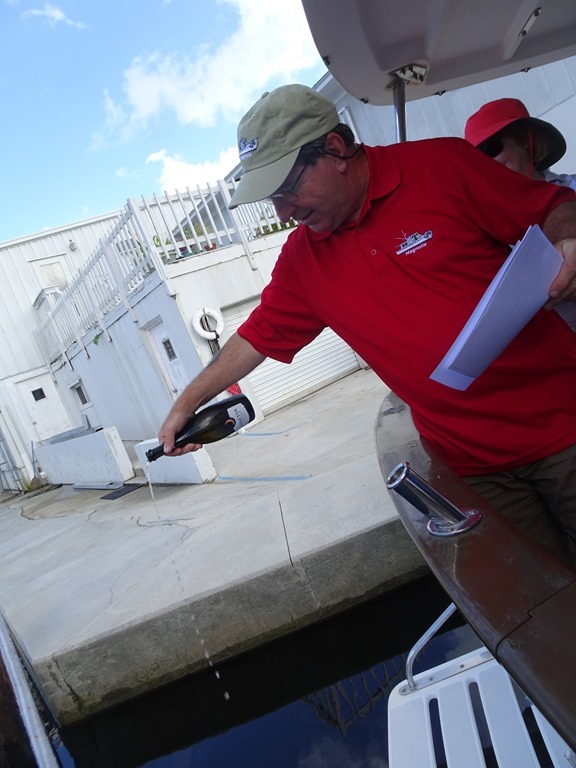 Firstly, you can continue to stuff points into the box (it accepts an infinite number) by taking seamanlike actions — say, by reefing the mainsail after you hear a gale warning on the weather forecast, or by putting on your safety harness every time you come on watch. Secondly, you can start to draw on your account. In all small-boat voyaging there is an element of risk that cannot be eliminated. Indeed, it is the lure of danger (and overcoming it) that attracts many to the sport. Inevitably, therefore, there will be times when the ship and her crew are in danger to some degree, despite all the precautions you might take. This is when the points start expending themselves. You have no control over when and where they’re spent. Butthey know when they’re needed. When horror is rife, when the mast is crashing down around your ears, those chips come rushing out of the black box to fight on your behalf. But they have to be available. You must have earned them in the first place. That’s why some boats and some sailors survive gales and capsizes when others don’t. Some boats will go aground on the only rock for miles around. Others will happily blunder through a maze of reefs. Some people have a name for it, a four-letter word ending with u-c-k. But on our boat we don’t believe in l-*-*-* and we never pin our hopes on it. We try, instead, to earn points for our black box. We know that if misfortune catches us with an empty box we’re in trouble. Fate allows no overdrafts. So there’s really no need to wonder why some people and some boats seem to be treated by Fate more kindly than others. It all depends on how much you’ve got in your black box. Incidentally, you can never tell exactly how much credit you’ve earned, so you can never relax completely. If you examine your conscience you will have a fair idea of how full your black box is, but to be sure of having enough points you must keep learning the ways of the sea, and the way of a ship in the sea. And you must keep putting your knowledge to practice. In other words: Look after your ship, and she’ll look after you. 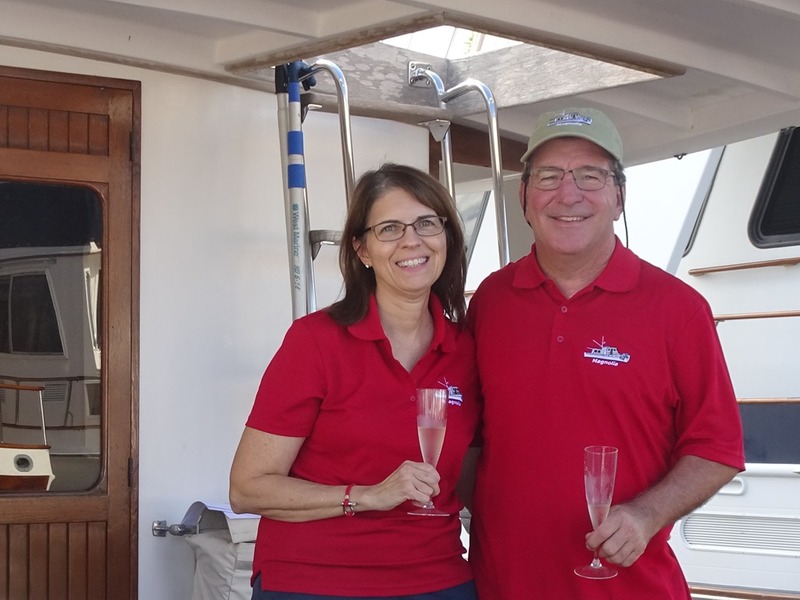 Our friends Kurt & Debbie sent us some some small tokens to carry aboard Magnolia-s and “seed” our box aboard. 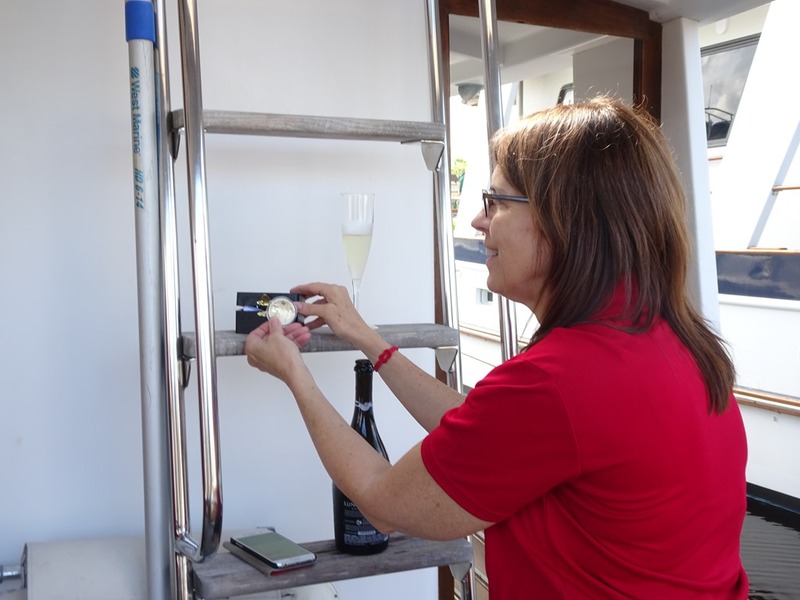 In addition our friend Al & Michele made us a small black box along which also contained valuables to carry to sea with us. Between these two presents we committed to taking care of Magnolia and she we. A wonderful time had by all. In addition Mike Camacho who served and commissioned Ticonderoga with was able to attend the after party. 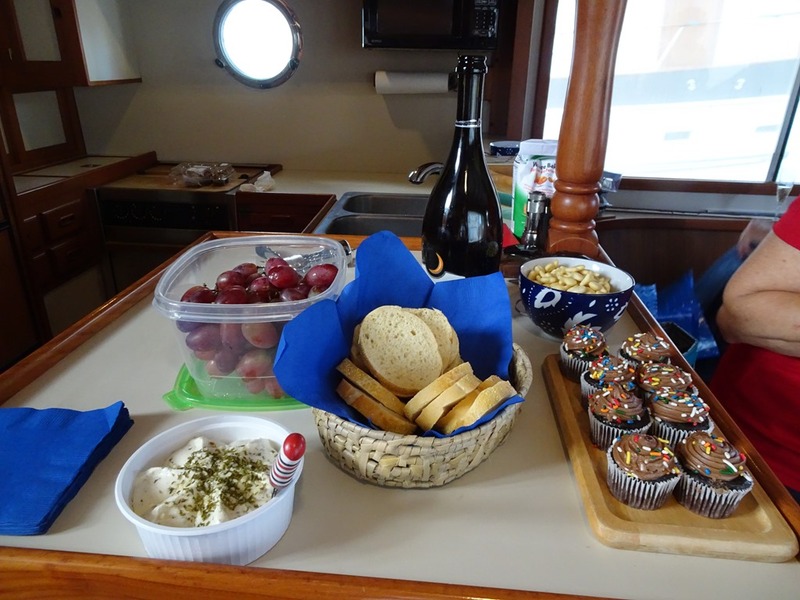 Though the galley was not ready for full service, we did manage to rummage up some snacks!!! 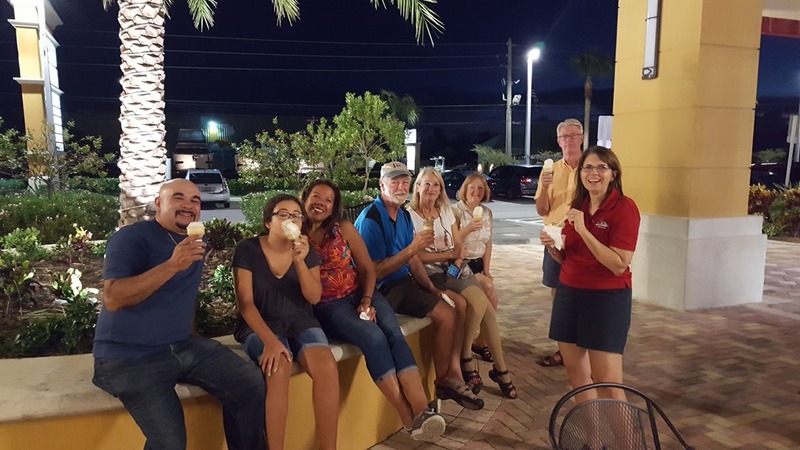 There was of course after snack ice cream! 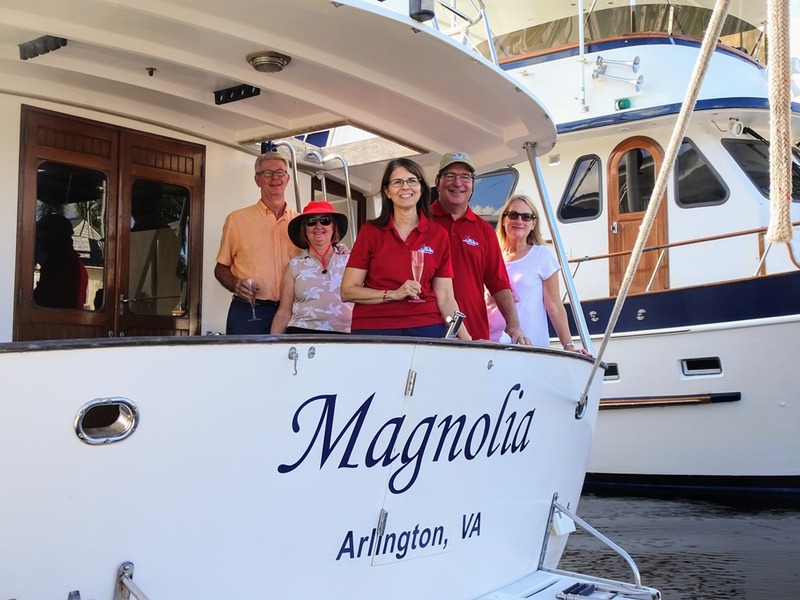 Magnolia was hauled Monday morning at 7:30 am ready to spend some time on the hard. 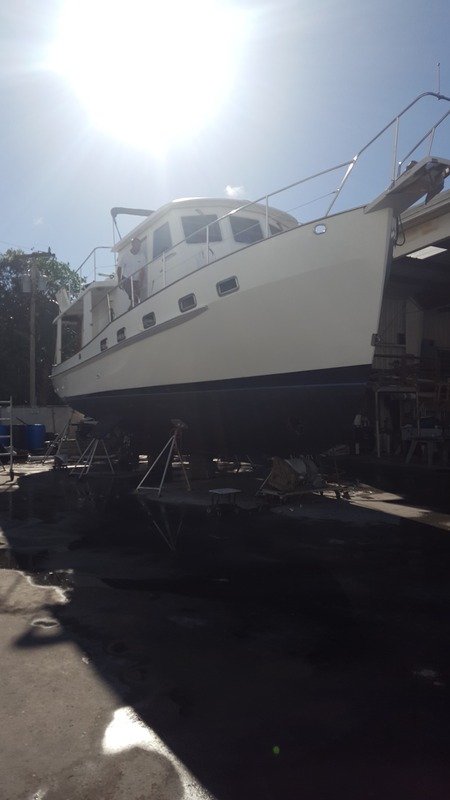 A good bottom clean and some hull wax went a long way toward brightening her up! 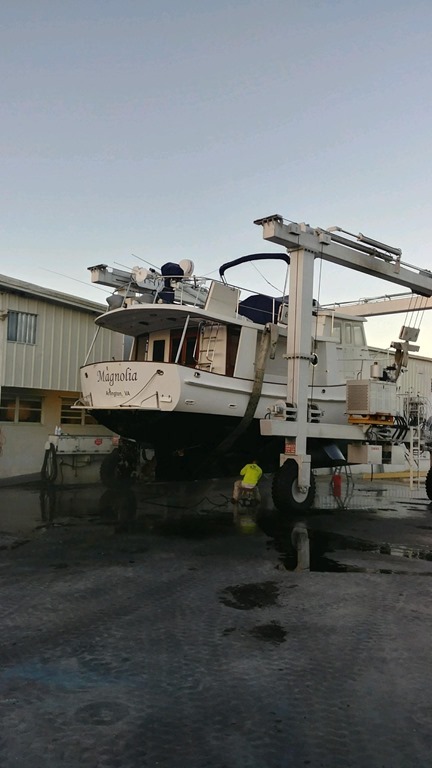 The Naiad Team came up from Fort Lauderdale and quickly disassembled the stabilizers. This one job was the most stressful thing we have had done on Magnolia since we have been here. The stabilizer system was the ships system we knew and understood the least. It is also one of the most expensive so we were truly ecstatic to find system internals to be in such good shape. A major major bullet was dodged. It was definitely a sun came out kinda day! I have also been helping the landlord from our rental house with some chores. 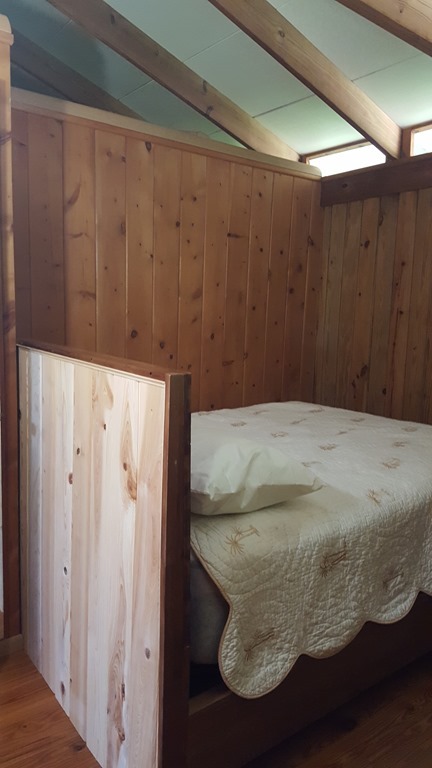 In the second bedroom which quite small she wanted the back of the headboard face with knotty pine to blend in with the existing walls. It took a little bit to figure it out but the completed project which contains 6, yes 6 wired brads came out quite nice. 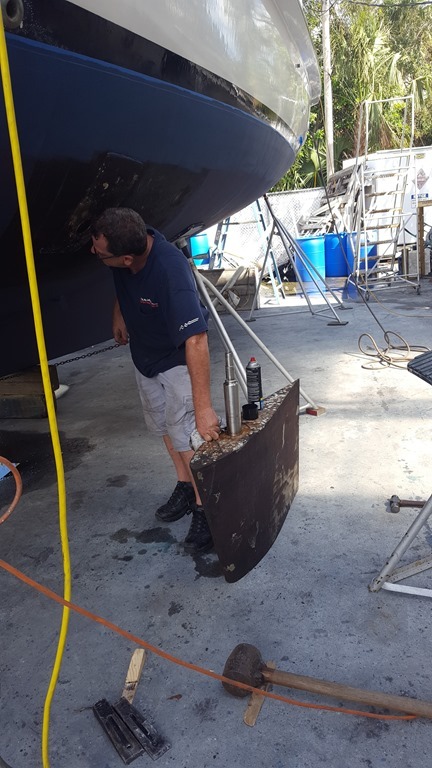 Back aboard, Ray started stripping the pilothouse sole. 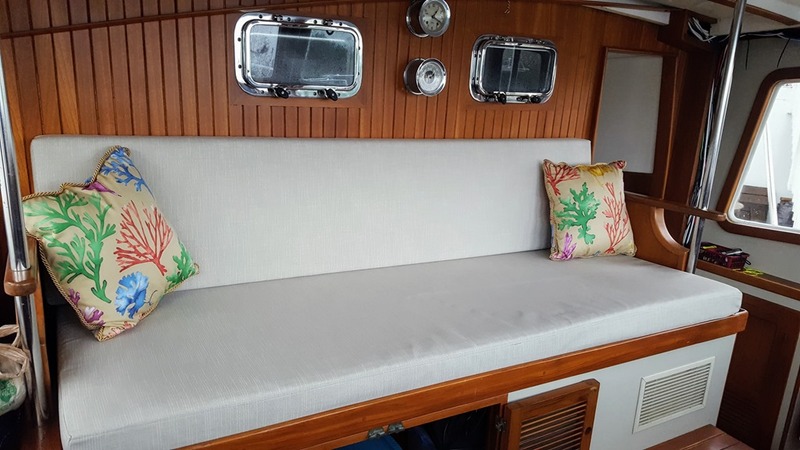 The pilothouse is the only place where there is Teak and Holly. The varnish had broken down in several places so a complete strip down. 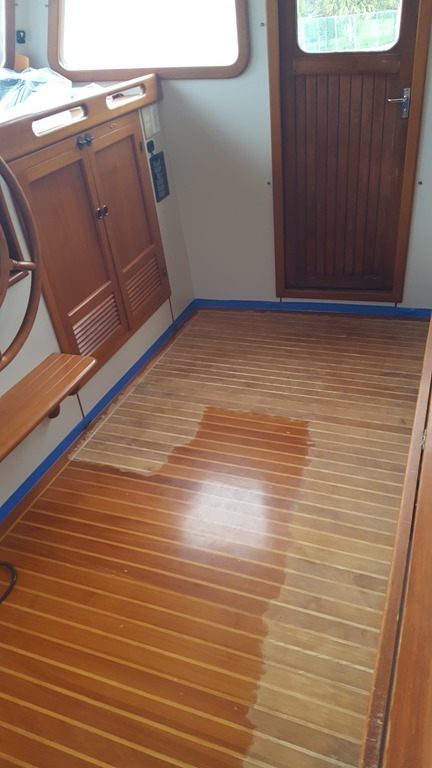 The rest of the cabin sole is parquet and will receive light sanding and varnish. 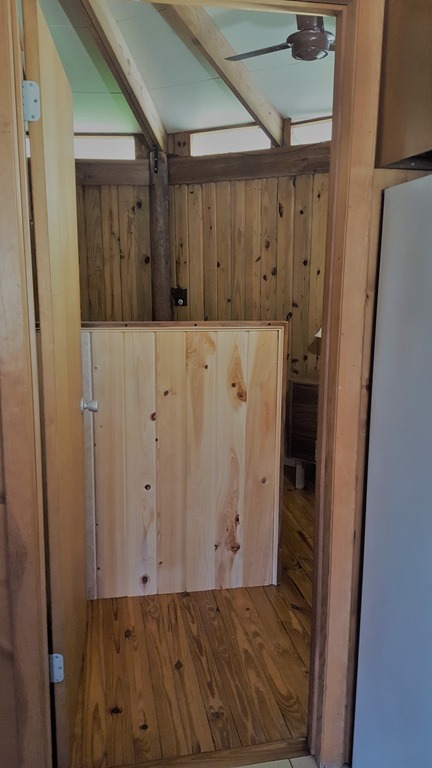 This will be a barefoot boat inside! 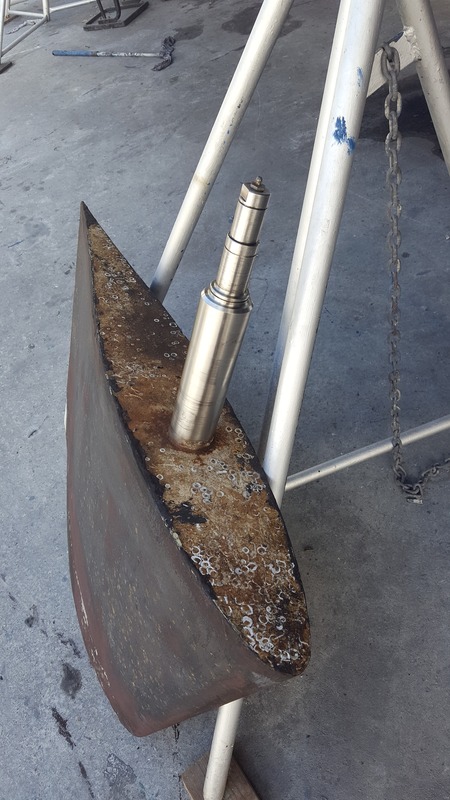 One of the depth transducer mounts cleaned up and ready. I caught Ray on a rainy day dressed to the nines….how does he keep the ladies at bay! Seriously he has worked very hard, taught us a lot and helped make our vision a reality. 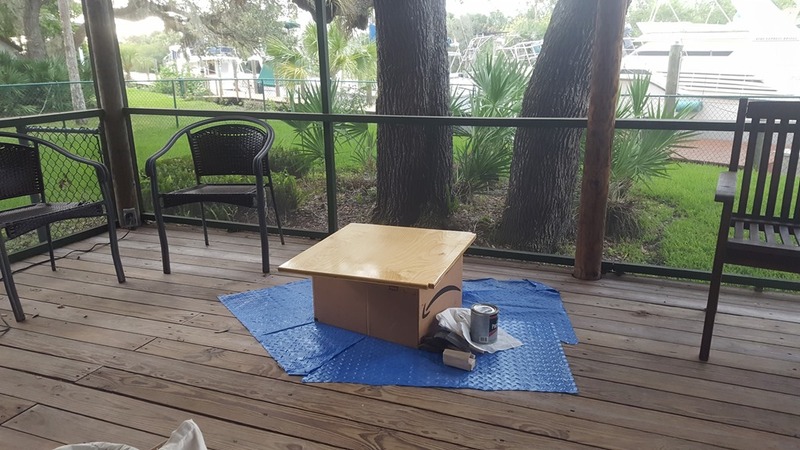 Meanwhile back at the rental house I have varnish on the laundry room deck plate. 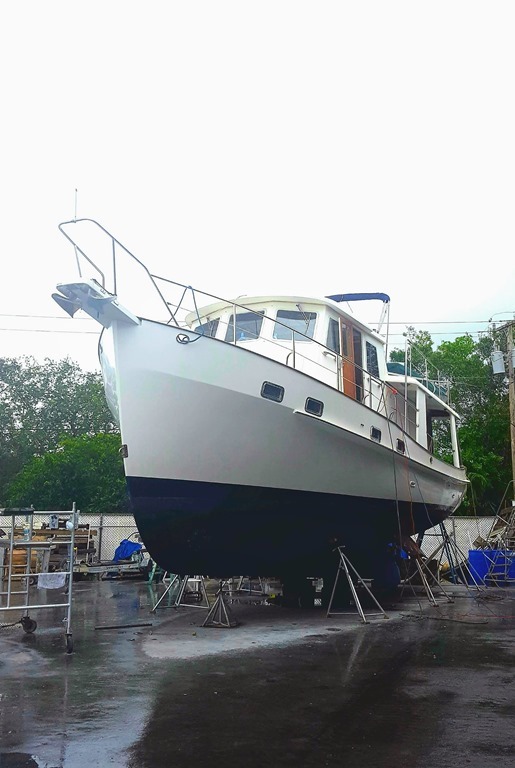 Our girl fully dressed and ready to splash…hopefully Monday morning (tomorrow). Can’t wait to see her in Southport! 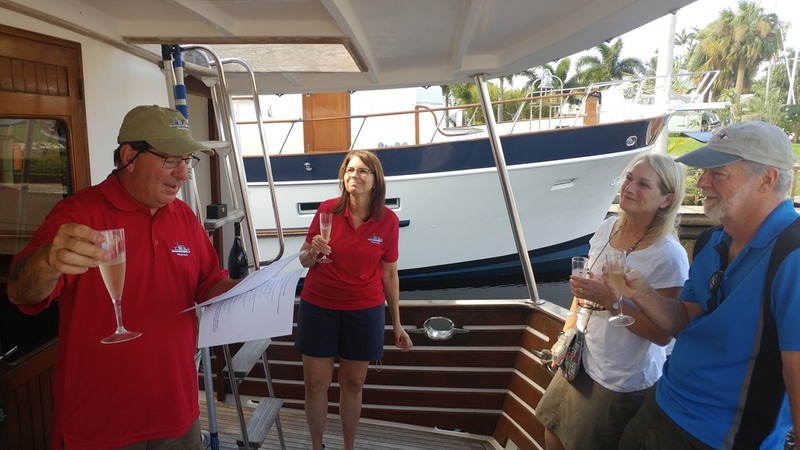 It is evident that a lot of hard work was done to make her seaworthy. Can’t wait to see her at our dock! I can’t believe all you have done to her. 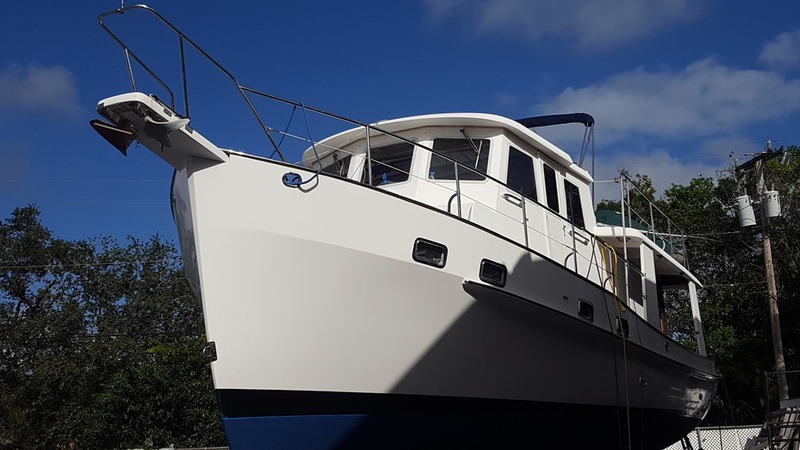 We’re taking mental notes in case we follow suit and get a trawler when we sell Braveheart. t looks wonderful. I can’t get over how much you’ve done to her. 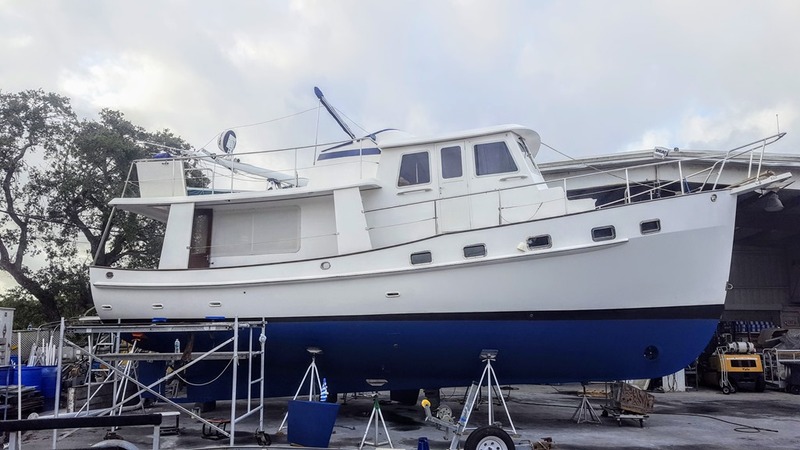 I know you’ll be glad when all of the work is finished and you can just live on her with normal maintenance. Can’t wait to see her at our dock! WOW you two. You have really done a superb job. She looks great! What a fun christening and pictures. Amazing how much you have done with your pretty girl. She is truly a grand dame! Just beautiful. Excited for you guys! 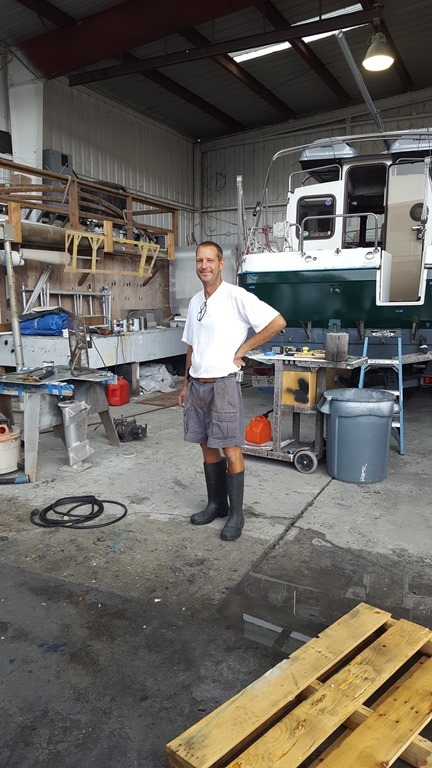 Is Kindred Spirit the same one that was just here at Snead Island Boat Works? Magnolia looks lovely. We dream of owning a Kady Krogen but sadly they are out of our price range. 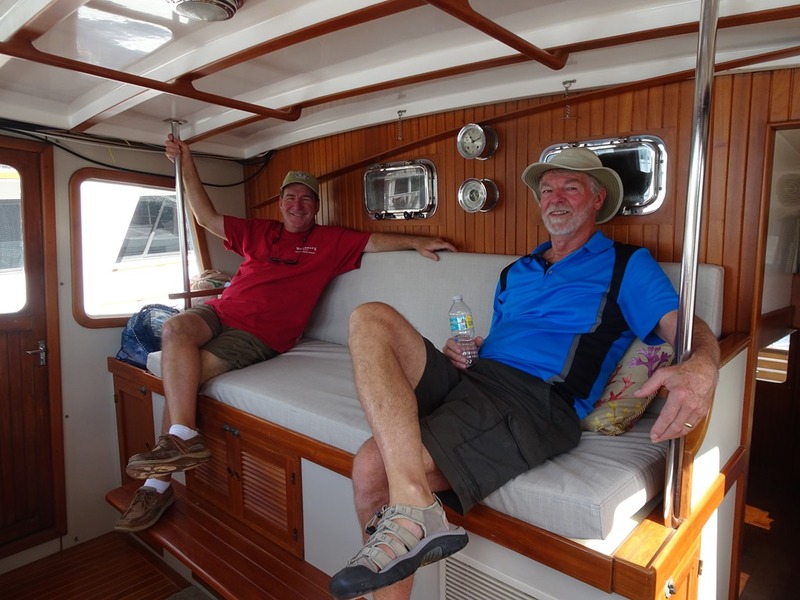 Kindred Spirit was a Morgan 43..new owners kept name. New KS is a Mariner Orient 38. Not sure where Sneads is? 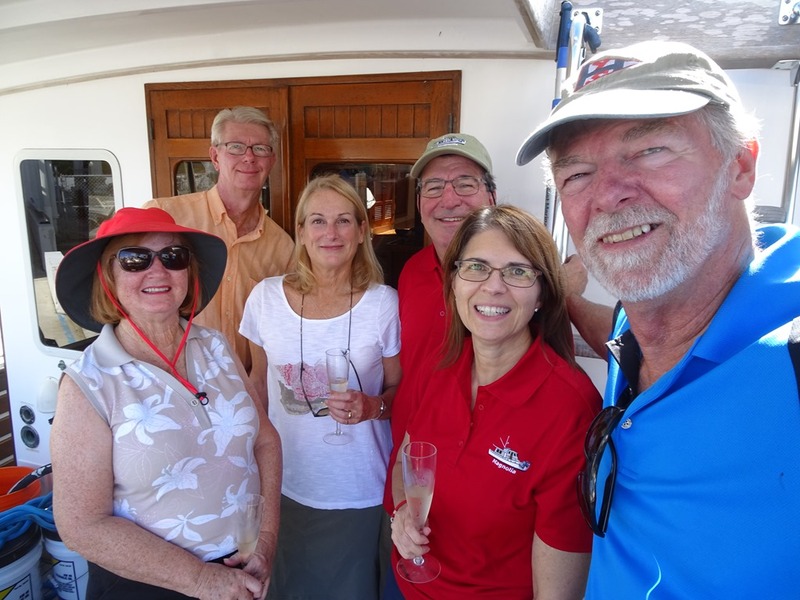 Congratulations on all the accomplishments Pals….the ship looks great and the renaming ceremony looked like a lot of fun. Hope we can sync up this Winter. Wow, guys, what a beauty Magnolia is!!! You have done a fabulous job restoring her. 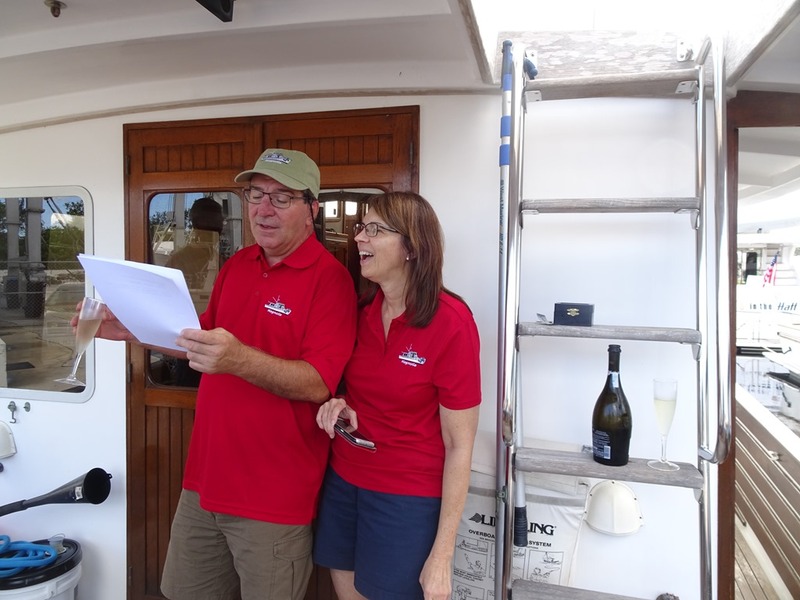 Now comes the really fun part – back to CRUISING! Fair winds and following seas on your new adventure!